Three-quarters of all lawyers work in a law firm. In its simplest form, a law firm is a business entity in which one or more licensed attorneys engage in the practice of law. The numbers, titles, and roles of law firm attorneys vary based on the size and complexity of the firm. Below is an outline of the various attorney roles within a law firm and how each role fits into the law firm hierarchy. In addition to lawyers, law firms employ non-lawyer executive and staff such as paralegals and secretaries to support the firm's legal and business functions. The managing partner sits at the top of the law firm hierarchy. A senior level or founding lawyer of the firm, the managing partner manages the day-to-day operations of the firm. The managing partner often heads an executive committee comprised of other senior partners and helps establish and guide the firm's strategic vision. The managing partner usually assumes management responsibilities in addition to maintaining a full-time law practice. Law firm partners, also called shareholders, are lawyers who are joint owners and operators of the law firm. The type and structure of law firm partnerships vary; sole proprietorships (firms with only one attorney), general partnerships, limited liability companies (LLC's), professional associations and limited liability partnerships (LLP's) are the most common. Most law firms embrace a two-tiered partnership structure: equity and non-equity. Equity partners have an ownership stake in the firm and share in the law firm's profits. Non-equity partners are generally paid a fixed salary and may be vested with certain limited voting rights in law firm matters. Non-equity partners are often, although not always, promoted to full equity status in one to three years. They are frequently required to make a capital contribution or "buy-in" to become an equity partner. Associates are law firm lawyers who have the prospect of becoming partners. Large firms divide associates into junior and senior associates, depending on merit and experience level. The typical law firm lawyer works as an associate for six to nine years before ascending to the partnership ranks ("making partner"). When, and if, an associate makes partner generally depends on a combination of factors including the associate's legal acumen, client base and how well he or she fits into the firm's culture. Of Counsel attorneys are not employees of the firm but usually, work on an independent contractor basis. 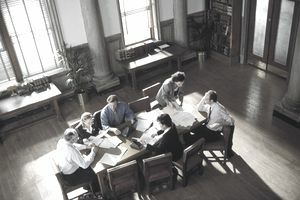 Attorneys who serve as "of counsel" are usually experienced, senior lawyers who have their own book of business and a strong reputation in the legal community. Some of counsel attorneys are semi-retired lawyers who were formerly partners of the firm. Other of counsel practitioners are hired to augment the firm's client base or knowledge base. Most of counsel lawyers work on a part-time basis for the firm, manage their own cases and supervise associates and staff. Summer associates, also called summer clerks or law clerks, are law students who intern with a law firm during the summer months. In small firms, this internship may be unpaid. Large firms, however, often have well-established summer associate programs that serve as a tool to recruit young, talented lawyers. These positions are often highly competitive and well-paying. At the end of the summer, the successful summer associate will receive a permanent offer of employment to work for the firm upon graduation.